Lesson Plan - Dirty Water, So What? Lesson Plan: Dirty Water...So What? Understanding all of the different ways that water can cause problems in a society can be a big challenge. The simple jigsaw activity and quiz are based off of the 4 effects components on our website (health, hunger, poverty and education). They are easy to understand but should still give students a glimpse into the complexity of the situation. 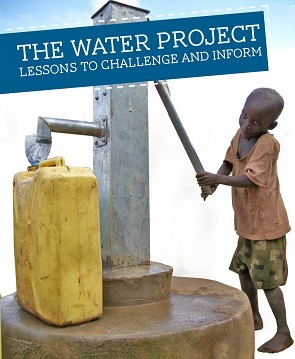 To learn about the effects of the water crisis, we suggest utilizing a jigsaw approach. Have students get in groups of 4; this group will be their 'home group'. Assign each student one web-page to read to themselves: Health, Hunger, Poverty, and Education (links listed below). After reading the material, students will form an 'expert group' where they will meet with the students from the other 'home groups' who have read on their same topic. They will discuss with their 'expert group' and determine how best to teach their 'home groups' about their subject. After meeting with their topic groups, students should return to their 'home groups' to teach the other students about their particular sections. A simple half-page quiz is included to ensure that students have actually communicated the critical information to their 'home groups.' In the jigsaw method, the quiz should not be graded but simply be used as a check to ensure that students communicated overall ideas, not necessarily specifics. You may choose to use the quiz page as both a pre- and post- test or cut the quiz page in half to only have students complete the quiz after the jigsaw experience. Create a public service announcement video using at least 1 fact from each effect. If you send us the YouTube link, we may even repost it! Host a debate arguing which effect has the greatest impact - or have students write position papers. Write a story about a family that experiences the effects of dirty water and predict how their life might be different after a well or other project is built. Give two reasons why a student might miss class as a result of having dirty water? True or False. At every age, men are more likely than women to go collect water. True or False. In general, people in urban areas are more likely than people in rural areas to have access to water and sanitation facilities. Give two examples of how dirty water keeps people in poverty. This group is most susceptible to waterborne diseases.